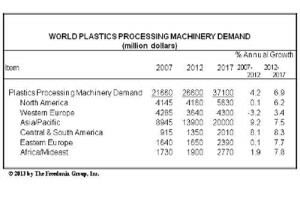 The global market for plastics processing machinery is expected to advance 4% per year through 2019 to US$35.8 billion, according to Freedonia’s forecast. Demand in many parts of the world will return to a more moderate pace of growth after a strong recovery from 2009 recessionary lows, although pent-up demand from the recession will continue to drive investments in machinery in the near term. Healthy increases in fixed investment spending and plastics demand will benefit machinery suppliers, as will rising plastic utilization in a number of end use industries, most particularly motor vehicles and construction, the report said. 3D printers, which represented an exotic niche market a decade ago, are the fastest growing equipment type, with sales projected to exceed US$2.0 billion in 2019. 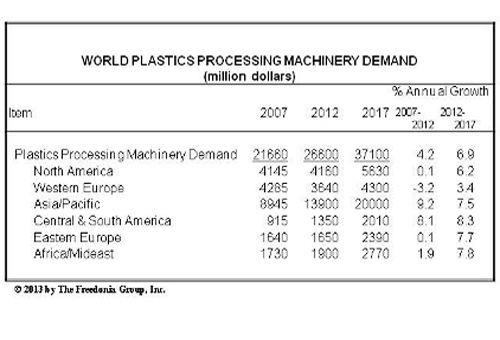 “This trend is projected to continue, and plastics processing machinery sales will expand into new markets, such as dental, educational, and medical applications,” said Freedonia analyst Zoe Biller. Injection molding equipment, however, will remain the most widely used variety of plastics processing machinery in the near term, due to its versatility and the generally high quality plastic items it produces. As a result, injection molding will account for fully two-fifths of global plastics processing machinery demand in 2019. The Africa/Mideast and Asia Pacific regions will record the strongest growth in percentage terms through 2019, predicted Freedonia. The Asia Pacific region will be led by some of the fastest growing national markets in the world, including Vietnam, India, and Indonesia, which have rapidly expanding plastic product industries. The large and influential Chinese market will also record gains above the global average and will represent nearly one-third of the world market in 2019, garnering by far the largest share of demand of any country. The Africa/Mideast region will be led by such fast growing markets as Turkey and Saudi Arabia, as many countries in the region attempt to diversify away from resource extraction economies and toward higher value manufactured goods.